Snuggle your litte one in ultimate warmth & insulation for winter. Here at SNUGBAGS we have further developed the unique three layer design of the Winter Duvet Merino Sleeping Bag by adding extra warmth with pure brushed New Zealand Merino fleece. This award winning design has a unique 3-Layer System of premium, ethical, sustainable and natural products – something we talk about all the time because when it comes to babies sleep this is hugely important! Layer 1 - Each of our Winter Duvet Deluxe bags has a luxuriously warm & dense brushed merino FLEECE inner. It provides ultra-warmth, superior insulation, greater breathability & moisture wicking properties. It's cosy 'cushion' feel creates an extremely comfortable sleep environment for your little one, keeping your child warm, safe and snug all through the night. ​Layer 2 - In addition to our 100% natural Merino fleece lining we have a middle layer of plush bamboo/cotton wadding for extra warmth. ​Layer 3 - our outer layer is a soft Organic cotton. ​Our winter duvet deluxe sleeping bag is designed for the coldest months of the year and as a guideline would be similar to wearing one sheet and a thick wool duvet. Our winter duvet deluxe merino sleeping bag is the warmest sleeping bag available whilst still being very soft and comfortable for your little one to sleep in. Generous lengths to make sure your child doesn't outgrow his bag. NB-2 is 90cm and 2-4 is 110cm. Pure luxuriously warm New Zealand merino fleece inner, a plush bamboo/cotton duvet wadding for extra warmth and soft Organic cotton outer. A handy seat belt slot for easy use in pram. Full zip to ensure easy nappy changes and dressing. Domes under arms to adjust size for very small babies. Eco-friendly & safe for your baby - all fabric dyes are certified Organic (GOTS certified) and are free from formaldehyde, solvents and other harsh chemicals. ​SNUGBAGS™ Unique Diagonal Zip Design™ is the first sleeping bag to combine the best features of a front zip and a side zip sleeping bag. The diagonal zip starts at the front, and zips across the body, down the side, and along the bottom of the sleeping bag. Our fabrics are 100% natural and untreated and it's natural for the merino fleece lining to pill and shed slightly. As with all merino fleece fabrics this a normal part of wear and tear. We could have treated the fabric with chemicals to reduce shedding and pilling but it would loose it's softness. We recommend machine washing the sleeping bag before use. Fibres will settle afer 2-3 washes. 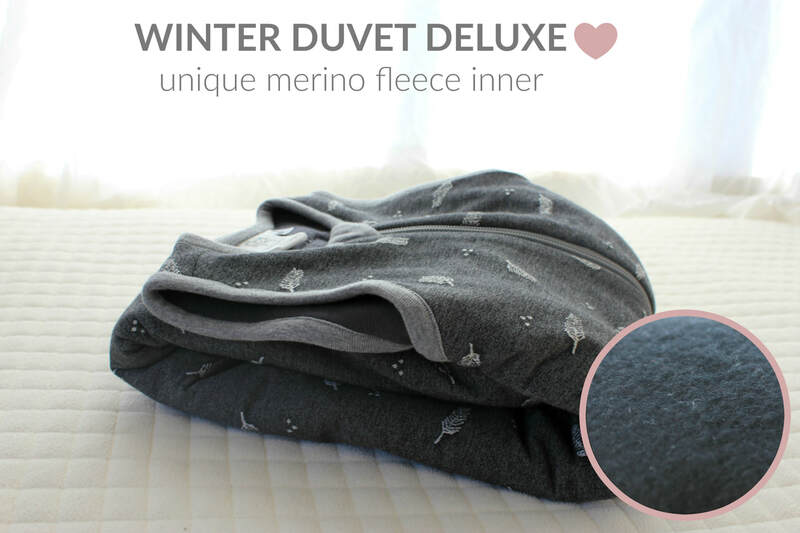 WINTER DUVET DELUXE or HIGH COUNTRY DELUXE?